So after prioritizing the standards, what then? “Unwrap” them! Priority Standards provide focus; “unwrapped” Priority Standards provide clarity. “Unwrapping” demystifies the often muddled meaning of academic content standards. In 2003, I wrote “Unwrapping” the Standards: A Simple Process to Make Standards Manageable. This first volume includes over 80 kindergarten through high school examples of “unwrapped” state standards, with related Big Ideas and Essential Questions. 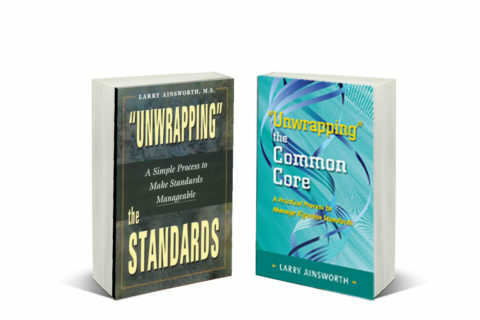 In 2013 I updated the process in “Unwrapping” the Common Core: A Practical Process to Manage Rigorous Standards. Based on my years of experience presenting “Unwrapping” workshops across the country, the book provides a detailed, how-to guide for busy K-12 educators and shows how to assign levels of rigor to each of the “unwrapped” concepts and skills. Applicable to all standards, not Common Core only, it’s organized in an easy-to-read format with 60 ELA and math examples illustrating each of the four steps in the process. 1. “Unwrap” the Unit Priority Standards. Analyze and deconstruct (break apart) the Priority Standards to be taught in a unit of study in order to determine the specific, teachable concepts and skills that students need to know and be able to do. 2. Create a Graphic Organizer. Choose a graphic organizer format (outline, bulleted list, concept map, or chart) to visually display the “unwrapped” skills and their related concepts. Determine the approximate level of rigor for each skill-concept pair, using Bloom’s Taxonomy and/or Webb’s Depth of Knowledge. 3. Decide the Big Ideas. Referring to the “unwrapped” concepts, decide the Big Ideas (key understandings, “aha’s”) you want the students to discover on their own—and be able to state in their own words—by the end of the unit of study. 4. Write the Essential Questions. Referring to the Big Ideas, write creative, open-ended Essential Questions that will engage students throughout the unit and lead them to discover the Big Ideas for themselves. Engaging students in the material to be studied by setting a purpose for learning (Essential Questions). Even if your standards change in the future, “unwrapping” will remain relevant. You will always be able to use this timeless process with whatever standards you are assigned to teach.